Corrective Action/Preventive Action planning (CAPA) is a pillar of the Quality system. Still, many organizations struggle to build the skills necessary to determine the root causes for problems and build effective and sustainable improvements to address those root causes. 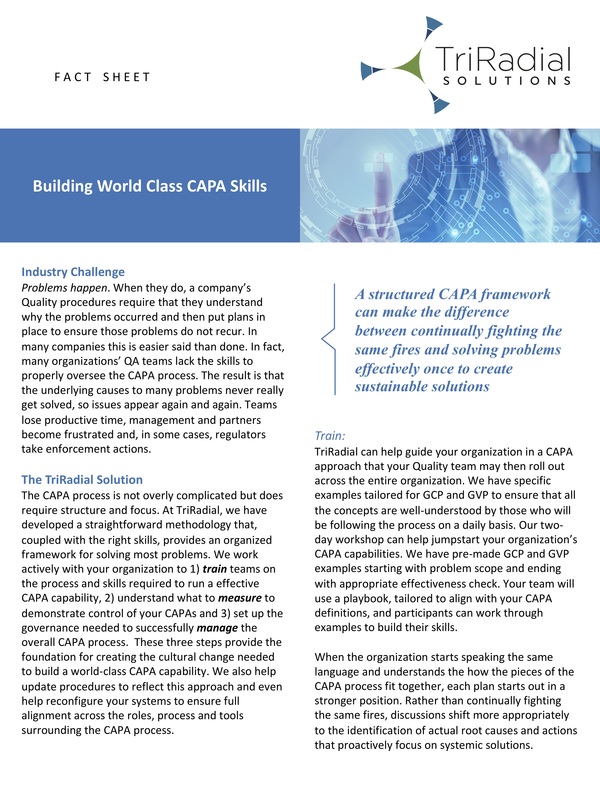 We can help you not only establish a robust CAPA framework and processes, but also build the coaching skills within your Quality unit to make sure the CAPAs work as intended. We help guide front-line team members in how to best conduct investigations and propose actionable plans. Our workshops are tailored to the GCP and GVP environments, understanding that it has to make sense to those who conduct and monitor trials and safety. Our proven five-step approach ensures that problems are scoped, investigated, improved and remain effective. We can also help revise existing procedures and systems to ensure maximum alignment.